Eun-Ha Paek’s sculptures examine the ways in which nostalgia and power can be contained in objects as visual representations of people’s collective stories and memories. With a background in animation, her work is influenced by her experimentation with telling stories without words. She seeks to construct narratives blending the boundaries between the familiar and the strange, exploring grief and hope with humor. Born in Seoul, South Korea, Eun-Ha earned a BFA from the Rhode Island School of Design. Her animated films have been screened at the Guggenheim Museum and Sundance Film Festival. 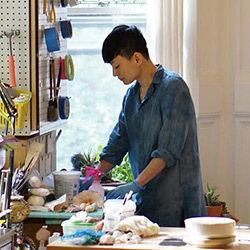 Eun-Ha has been a guest lecturer at the Rhode Island School of Design and Fashion Institute of Technology in New York and a visiting critic at the Maryland Institute College of Art. She joins the Bray as a 2017 Windgate Scholar. To view more work by Eun-Ha visit her website at eun-ha.com.